Considered an essential conservation tool, plant reintroductions have been conducted for many of the world's rarest plant species. The expertise and knowledge gained through these efforts constitute an essential storehouse of information for conservationists faced with a rapidly changing global climate. This volume presents a comprehensive review of reintroduction projects and practices, the circumstances of their successes or failures, lessons learned, and the potential role for reintroductions in preserving species threatened by climate change. Contributors examine current plant reintroduction practices, from selecting appropriate source material and recipient sites to assessing population demography. Traditional reintroduction practice can inform managed relocation-the deliberate movement of species outside their native range-which may be the only hope for some species to persist in a natural environment. Included in the book are discussions of the history, fears, and controversy regarding managed relocation, along with protocols for evaluating invasive risk and proposals for conducting managed relocation of rare plants. 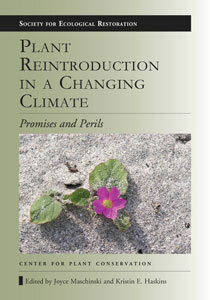 Plant Reintroduction in a Changing Climate is a comprehensive and accessible reference for practitioners to use in planning and executing rare plant reintroductions. "will serve as a very useful resource for anyone interested or involved in the management of rare plants." "A must read for those interested in [managed relocation]... There is more than enoughsubstance in this text to warrant a place on any conservation, restoration, landscape, or geographical ecologist's bookshelf." "A solid and core addition for science and environmental collections, Plant Reintroduction in a Changing Climate is not to be overlooked." "...this work will certainly be heavily used and referenced by diverse readers around the world." "Governments worldwide have committed to restoring at least 15 percent of the world's degraded ecosystems by 2020. Plant reintroduction is a vital component of this effort, putting the right species back in the right places. This book is essential reading for all who would join the global task of restoring the earth." "Plant Reintroduction in a Changing Climate provides a timely and comprehensive review of the science of restoring rare plant species. In our changing world, the threats to plants, and the need for restoration, are both rapidly increasing. This volume provides some of the best thinking on the design and implementation of reintroduction projects and belongs on the bookshelves of all those working to stem the losses of plant biodiversity." Chapter 2. Characterizing Two Decades of Rare Plant Reintroductions \ Edward O. Guerrant Jr. This unique member of the mint family (Lamiaceae) is found only in Indian River and St. Lucie County. It is a short-lived perennial with showy pink flowers that bloom in the fall that are pollinated by bees. Lakela’s Mint is one of six species of Dicerandra, each of which are endemic to only Florida and have their own unique minty aroma arising from a particular mixture of essential oils that are produced in glandular capsules on their leaf surfaces. The entire range of Lakela’s Mint is only a one-half mile wide by three mile long area in remnant scrub habitat, most of which has been converted to housing, commercial development, roads or railways. Potted specimens of Lakela’s Mint flowering in the greenhouse at BTG. Lakela’s Mint likely once occurred as one large contiguous meta-population within this area, but is now fragmented into five small, reproductively isolated colonies, each of which continues to decline in plant number due to overgrowth of competitive plant species and continued developmental pressure. The current estimate is that there are less than 10,000 individuals remaining. Partnering with St. Lucie County and Indian River County biologists, and with funding from the U.S. Fish and Wildlife Service and the state of Florida, Bok Tower Gardens has worked since 2002 to help conserve this species. Conservation efforts have included surveying each population annually to track the rate of increase or decrease in the remaining number of plants of this species, collecting seeds or cuttings from each population to preserve both seeds and living specimens in the Center for Plant Conservation’s National Collection, introducing a new population onto protected county property, augmenting a small population with additional plants and collecting quarterly demographic data on two populations. Bok Tower Gardens staff and volunteers recording demographic data on Lakela’s Mint in Indian River County. Based on data collected in early 2012, the forecast for the species looks promising. The introduced population is growing steadily. Seeds and specimens from all historically known sites, including some which are now extirpated, are now represented in the National Collection, so the unique genetic diversity of each will not be lost. Demographic data has been collected for a full five years on Lakela’s Mint, allowing a greater understanding of its response to events such as hurricanes and droughts, its average lifespan and lifecycle, and the amount of seedlings which naturally recruit each year and survive to become reproductive adults. Flowering specimen of Lakela’s Mint in the greenhouse at BTG. Although it will take years of continued efforts to truly understand and conserve, this species now has a good chance of persisting a little while longer. Cheryl L. Peterson is Conservation Manager at Bok Tower Gardens in Lake Wales, Florida. She is also a contributor to Plant Reintroduction in a Changing Climate.